Sunrise Easter service this morning. Personalize your eating plan because everyone is different. Now, let’s take a closer look at that second part: what “Your Way” implies. A personalized eating plan can accommodate your food preferences, lifestyle, cultural traditions and spiritual needs in addition to addressing risk factors and disease issues. Develop a personalized eating and fitness plan that embraces flavor, texture, and preferences while addressing food aversions, allergies, or disease complications and meets your nutritional needs to support a joyous celebration of life lived to the full. When defining your way, keep in mind that we reap what we sow. Everything is permissible, but not everything is beneficial. You can have just about anything you want in food and level of physical activity, but you must take what comes with it because our choices have consequences. Have you considered an eating plan? 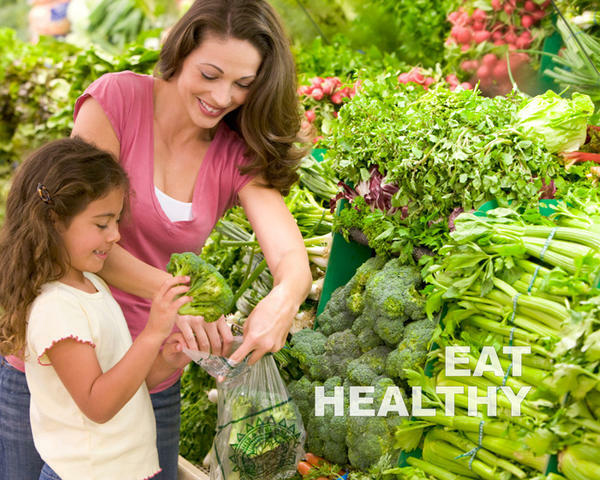 Choose to address your specific needs with a healthy eating plan that accommodates your food preferences, lifestyle, schedule, priorities, appetite, and long-term health goals. Your way to health needs to be broad enough to include nutrition, attitude, toxin removal, undoing wrong habits, rest and sleep, exercise, sunshine, pure air and water. When you align your health-related behaviors, your way, with your specific needs, you can achieve the optimal level of health that your body is capable of expressing. 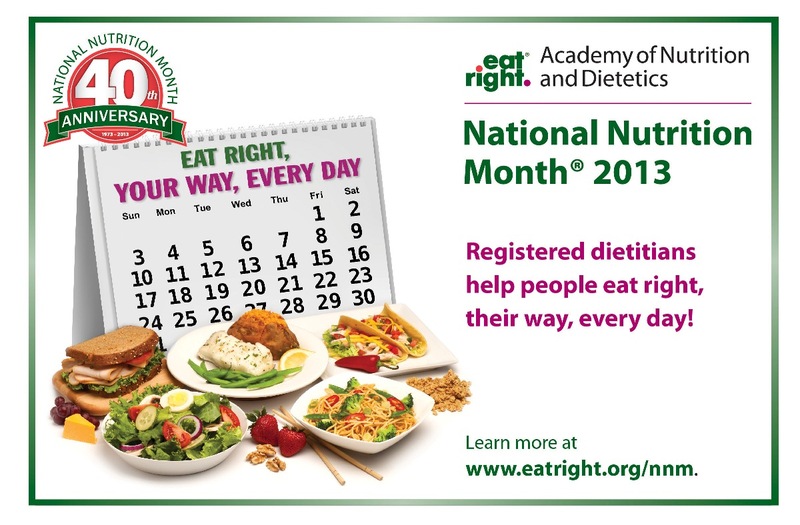 A Registered Dietitian can provide invaluable help as you learn to eat right, your way, every day! It’s easy to locate an RD near you. At www.eatright.org click on the button to “Locate a Dietitian” and enter your zip code or area of expertise needed. 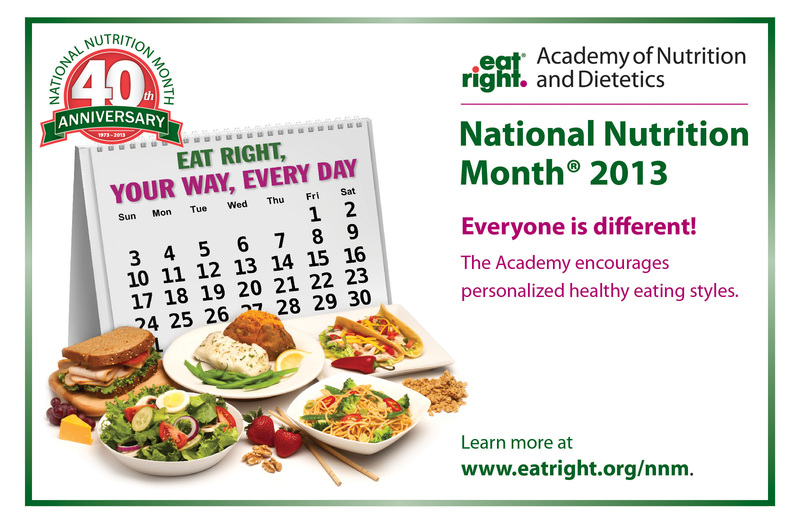 Click here to learn more about National Nutrition Month . Come back next week as I continue my Eat Right, Your Way, Everyday series. I will discuss how to stay the course and be consistent in making daily health choices. that his children obey him with proper respect. 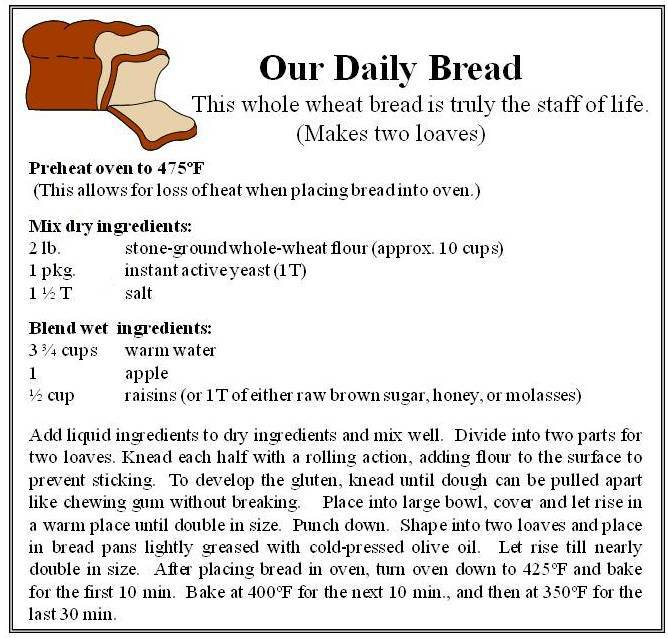 As a bread-winner and spiritual leader of your family, that question is critical and there are actions you can take now to help ensure your long term health. Half of the top ten leading causes of death for adults in the U.S. are chronic diseases with risk factors that are modifiable by nutrition. Modest changes in diet and exercise to reduce weight and change body composition can significantly lower the risk of cancer, heart disease, stroke, diabetes and hypertension or high blood pressure. Reduce your intake of saturated fat, cholesterol and trans fats and eat plenty of fruits and vegetables containing antioxidants, vitamins A and C, and whole grains to reduce your health risks. How can I stay healthy longer so I can take care of my wife and children? 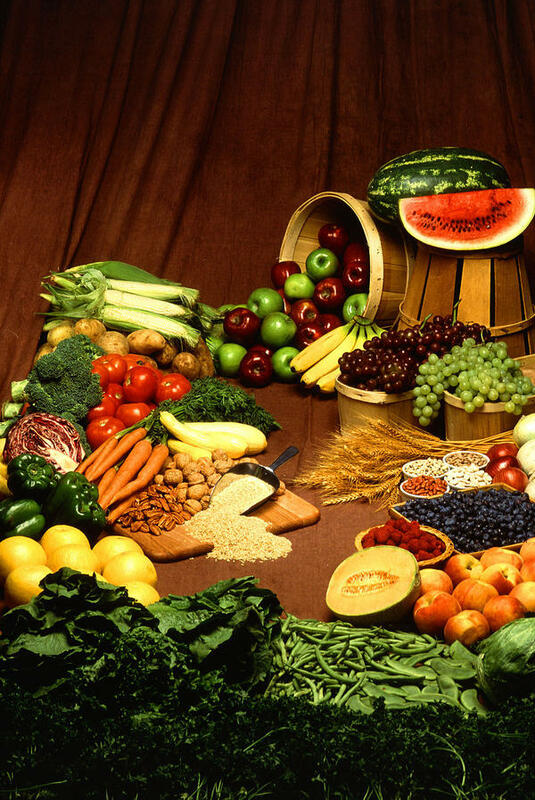 Choose foods that provide adequate vitamins and minerals. A preponderance of evidence indicates that your food choices may contribute to the development and progression of heart disease, cancer, and stroke, the three leading causes of death in the U.S. Your food choices also may help to reduce your risk of developing a chronic disease. For instance, diet-related obesity contributes to the risk of coronary artery disease, diabetes, stroke, and some types of cancer. A healthful diet reduces the risk of these diseases. To promote healing of traumatic injuries such as wounds and burns, additional energy and more of specific nutrients may be needed. Nutrition and your immune system are also inter-related. A deficiency of nutrients impairs your body’s immune response. Without sufficient nutrients, you are more susceptible to infectious disease. The presence of infection can also alter the status of several nutrients. Under-nutrition, compromised immune function, and infection can become a vicious circle. 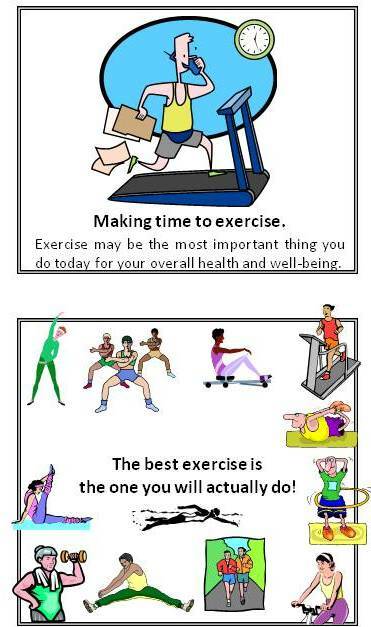 We’ll surely have time for illness later if we don’t make time for exercise now! Fun and safe exercise is possible for people of all ages and fitness levels. See your health services professional for help in starting and monitoring an exercise program tailored for you to achieve your optimal health. What type of exercise works for you? Share with us. Oh, the joys of a backyard garden! Even though the temperature has been above 100 degrees Farenheit for two weeks in a row, the garden has been resilient. As soon as we have a couple of overnight temperatures no higher than 75 degrees, we will have tomatoes galore. Already, we’ve harvested some tomatoes, lots of yellow crookneck squash, zucchini, broccoli, green leafy lettuce, cucumbers and Ronde’ de Nice (eight-ball squash). In the picture below, you can see the (plastic) guardian owls and hawks that keep watch over the garden. The pole beans and carrots are up but haven’t been harvested yet. The cucumbers are too numerous to keep up with. I’ve been freezing green peppers and tomatoes. Will try freezing cucumbers in a brine today. The cantaloupes are almost ready. The carrots need more time. We pulled up most of the watermelon vines — they were taking over and intruding on all the plants around them. We live and learn. We’ll allow more space next summer. 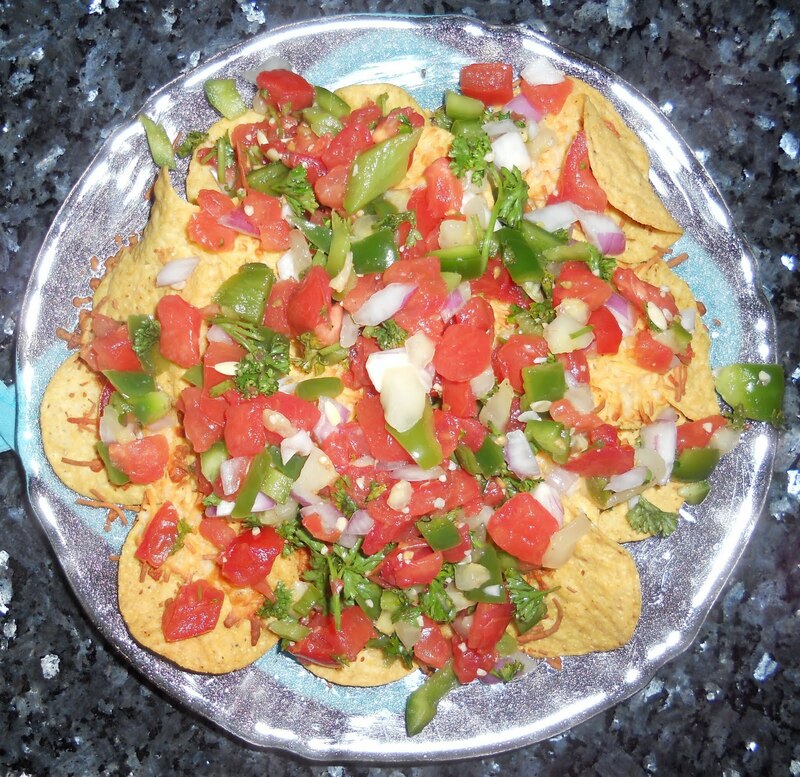 One of our favorite home garden recipes is summer salsa, shown in one of the pictures below. This time we served it over tortilla chips. It has tomatoes, green peppers, cucumbers, parsley, red onion, garlic, jalapeno, lime juice, garlic, cumin, salt & pepper. Terrific! Healthy lifestyle can be fun and tasty! We’ve been eating mostly from the garden and feeling great!